After freefalling for months, is the Iranian currency on the rebound? Iran's national currency has been on a months-long freefall. The cost of living for Iranians has soared, sparking angry antigovernment demonstrations in the Islamic republic. So the country's hard-liners were in celebratory mood after the rial unexpectedly rallied against the U.S. dollar earlier this week, prompting media close to the conservative camp to claim that the American currency was an "aborted," "clown," currency in "tears." The rial has lost about 70 percent of its value since May, when U.S. President Donald Trump pulled out of a nuclear deal between Tehran and world powers that had provided sanctions relief in exchange for curbs to its nuclear program. A first wave of U.S. sanctions was reinstated in August and a second phase will take effect in November. Just last week, the rial had hit a record low of 190,000 to the U.S. dollar on the unofficial market, but was trading at 170,000 to the dollar by October 1, according to foreign exchange website Bonbast.com, which tracks the unofficial market in Iran. Then the unexpected happened -- the currency's value soared to 135,000 to the dollar on October 2. However brief -- economists have warned that Iran's economic conditions remain likely to worsen -- the respite offered by the rial's unexpected recovery put the hard-liners, who have claimed to be in an "economic war" with the country's enemies, in a defiant mood. "The dollar burst into tears," wrote the moderate daily Kelid on October 2. The reformist Aftab-e Yazd newspaper wrote the same day that the fall of the dollar against the rial had made investors "nervous and anxious." In an editorial on October 2, the hard-line Javan news website, which is affiliated with Iran's powerful Islamic Revolutionary Guards Corps (IRGC), described the dollar as a "clown" whose fluctuation only served to "entertain the market and make the masses cry." 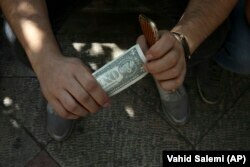 An Iranian street money changer holds a U.S. banknote in downtown Tehran earlier this month. On October 3, Javan ran another editorial in which it proclaimed that the "dollar had been aborted." The conservative daily Farhikhteganm wrote that "correct and logical" economic policies allowed the government to control the economy "irrespective of outside influences," in an apparent dig at the U.S. sanctions and the administration of President Hassan Rohani, a relative moderate who supported the nuclear deal and who has been at loggerheads with conservatives. Economists said there could be several reasons for why the rial rallied this week, including a new policy to import more foreign currency from abroad and giving the central bank freer rein to support the rial. Tehran also hopes that the European Union will be able to protect Iranian oil revenues and shield Iranian companies from U.S. sanctions. On September 27, the EU announced plans to create a so-called "Special Purpose Vehicle," a new payment channel to facilitate business with Iran and circumvent U.S. sanctions. Rising oil prices have also offered hope to the Iranian economy. Benchmark Brent crude is trading at just under $85 a barrel -- up from the mid-50s one year ago -- and some analysts believe it could reach $100 a barrel by the end of the year. To boost the economy, the president's office said on October 2 that Iran would offer five-year residency permits to foreigners if they invest $250,000 in the country. Economists and analysts are skeptical whether Tehran can stabilize the rial, with many expecting the currency to hit record lows when the second wave of U.S. sanctions targeting Iran's important oil sector kicks in in early November. Scott Lucas, an Iran specialist at Birmingham University in Britain and editor of the EA World View website, says it was unclear whether the rial's rally is simply a fluctuation or a long-term trend, although he says it appears to be the former. Lucas says the underlying reasons for the rial's low value have yet to be addressed. "The government has attempted to address the rial with tactics -- raising interest rates on savings, giving residency permits for people bringing foreign currency into country, and by restructuring the foreign exchange market," says Lucas. "But if you can't assure trade, investment, and production, you can't defend the rial." Iranian state TV showed people gathering outside Tehran's currency-exchange offices this week to sell their dollars. While the rial was trading at around 150,000 on the unofficial market on October 3, the official rate, cited by the central bank's website, is at the artificially low rate of 42,000. The official rate is rarely used in unofficial exchange offices and the government previously relented on its use after many banks refused to sell dollars at the rate. However, on September 29, the government said the central bank would intervene in the market through banks and official exchange offices to control the exchange rate and halt the rial's slide. Following the announcement, authorities cracked down on websites and social media forums tracking the unofficial foreign-exchange rate. Tehran's police chief Hossein Rahimi recently said that police had "dealt with" 15 websites that were posting "wrong" prices for the U.S. dollar.